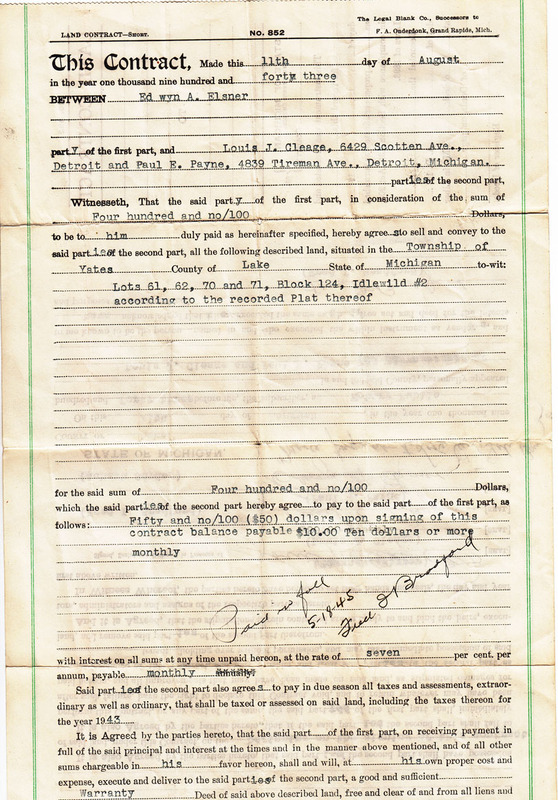 In 1943 my Uncle Louis Cleage and family friend, Paul Payne bought some lots in Idlewild, Michigan. 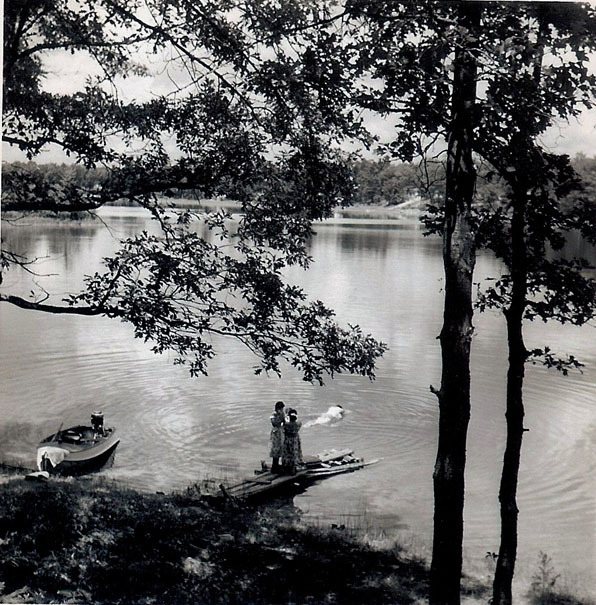 Idlewild is a black resort located in the Manistee National Forest in Lake County. It’s 5 hours north of Chicago and 4 hours northwest of Detroit. Lake Michigan is half an hour away at Ludington. 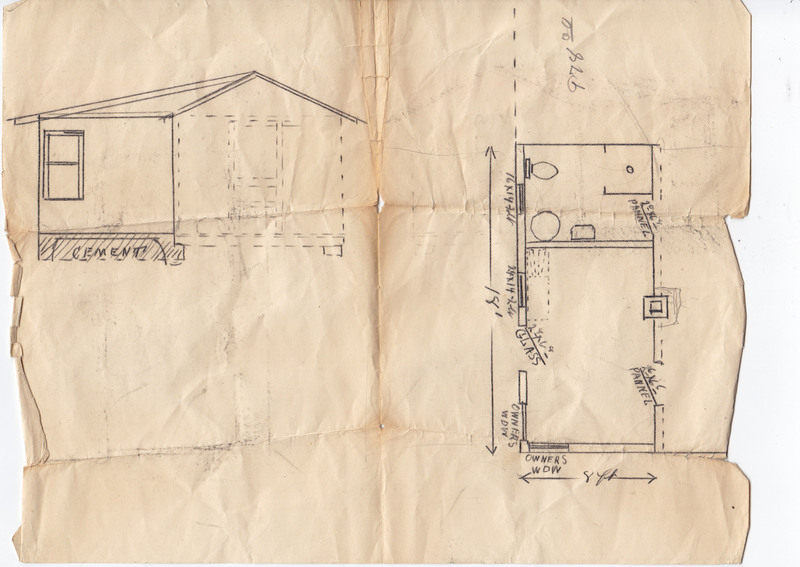 I’ve posted some photographs, documents and letters showing the progress of the original cottages. They did much of the work themselves. 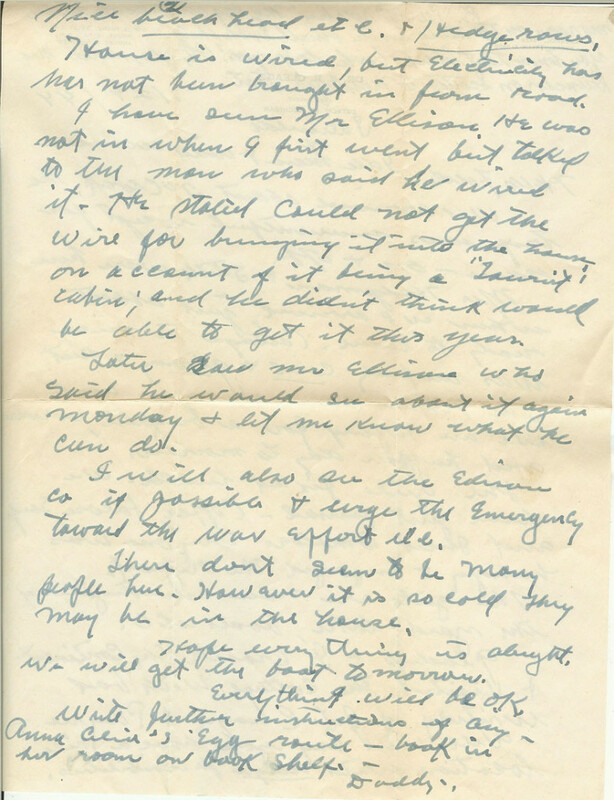 If you find the letter my grandfather wrote back to Detroit hard to read, scroll down to the transcription below. 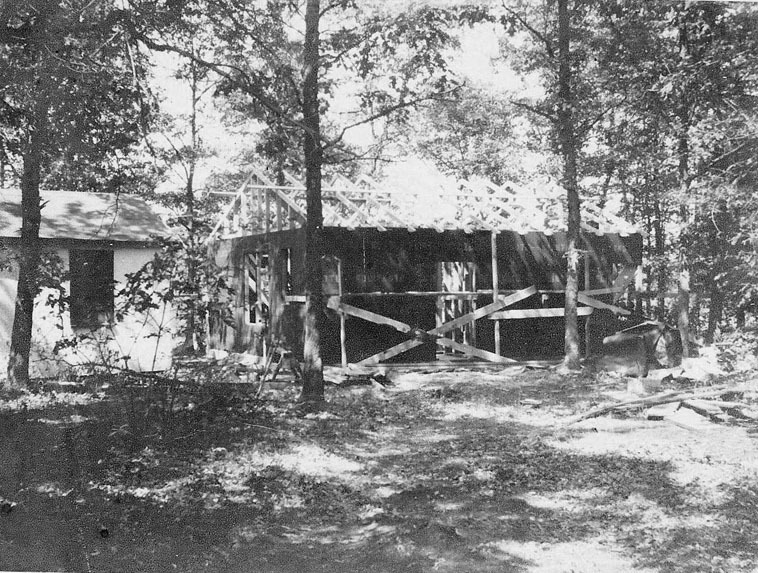 Original cottage being lived in while under construction. Louis Cleage on the patio. 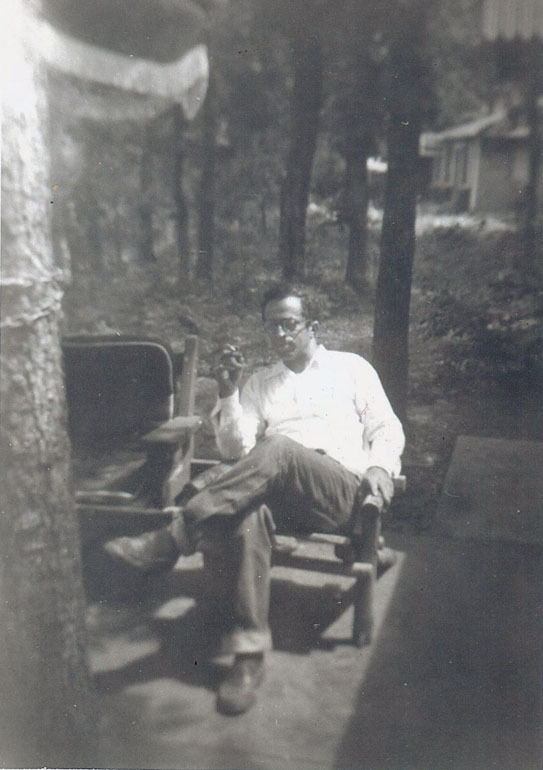 Dr. Albert B. Cleage, my grandfather. On the dock looking at Lake Idlewild. P.S. “Pee Wee” speaking. My egg route book is in my room on the table in the small bookshelf. You know that black book, don’t you? Oh, yes, add Mrs. Duncan on Scotten to Monday’s list. 7/29/1944 Idlewild of Idle men and wild women. We arrived about 2 o’clock. The trip was uneventful except for rain – on and off. Mrs. Hedgeman and Stith were here when we arrive just about ready to leave. Cottage is nice, was awfully cold and gloomy out. The rain seems over now and we are hoping for a brighter, warmer and happier day tomorrow. The girls are now investigating the yard, lake, boats, etc. 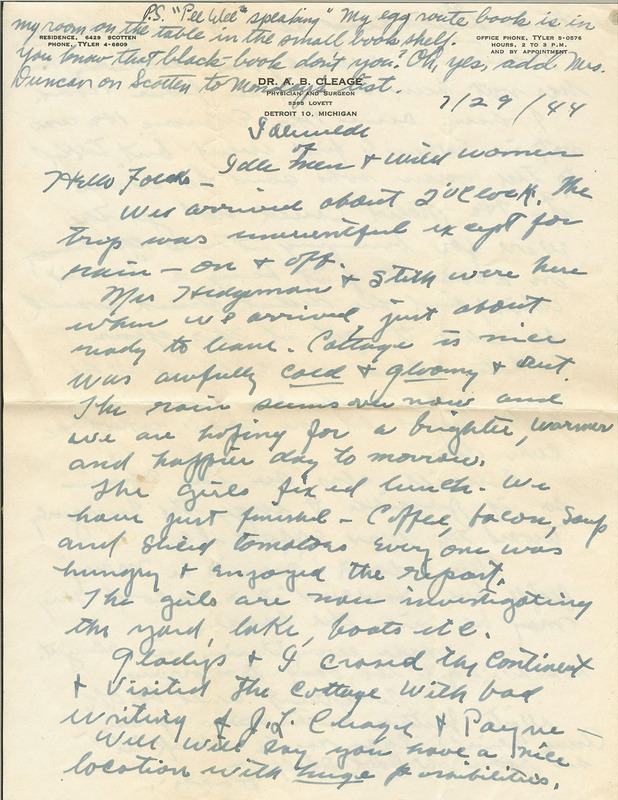 Gladys and I crossed the continent and visited the cottage with bad writing of J.L. Cleage and Payne – well, will say you have a nice location with huge possibilities. Nice beachhead etc, and hedgerows. House is wired, but electricity has not been brought in from road. I have seen Mr. Ellison. He was not in when I first went but talked to the man who was and he wired it. 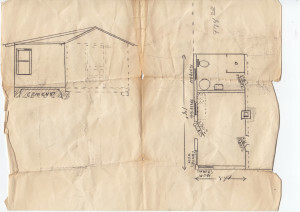 He stated could not get the wire for bringing it into the house on account of it being a “tourist” cabin; and he didn’t think would be able to get it this year. Later saw Mr. Ellison who said he would see about it again Monday and let me know what he can do. 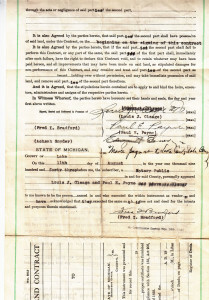 I will also see the Edison Co. if possible and urge the emergency toward the war effort etc. Starting work on the new cottage. 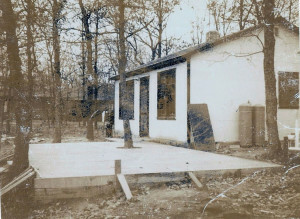 The forms with the new patio. New cottage. Old stairs on the left. They were made of logs set in the sand. The new steps you can see on the right, all cement and even and smooth. 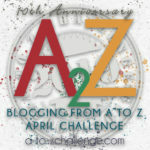 For other Sepia Saturday offerings, CLICK! Wish we could still go up there and it would be like it was. Loved everything abt this. Louis’s hair, Grandpa’s classic look. Wonder if those were Pall Mall’s or Camel’s? Looking out at the dock……Cold and Gloomy. Seems like that today here. Thanks for sharing. I don’t remember what they smoked but I know Louis often lit one cigarette with another and usually had on hanging between his fingers, dropping ashes until it caught up with him with lung problems. And even after that. We make an unbeatable team of ‘stuff’ holders. Beautiful. Nothing is more peaceful and restful than a few days in the woods in a cozy cottage. Yes, a small wooded lot in the middle of Atlanta cannot capture being in the real woods, with a lake right there. Wonderful again. I like the description of the name Idlewild. The photo of the jetty is picture perfect. Yes, people still say that – Idlewild, where the men are idle and the women are wild. At least the older ones. What a place to buy, priceless. The last photo reminds me of the cottages and now people’s family houses along Lake Michigan. 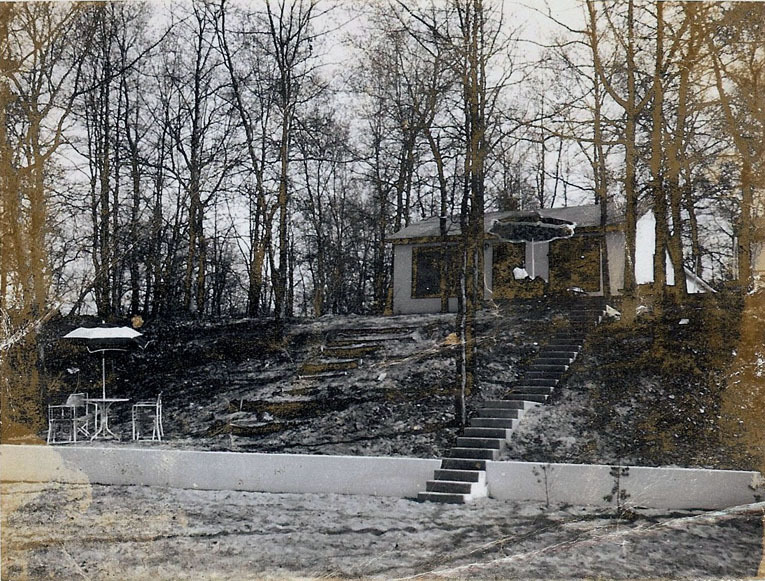 I always had fun at the beach with my cousins, (my aunt and uncle’s house is in Grand Haven) but seeing the houses some folks had, or cottages most of them were back then, many of them had those long stairs all the way up to the top. Thanks for sharing all the great photos too. The record player in the first photo is sitting on a vanity table sans skirt. Gosh, did that bring back memories. I had a vanity table like that one but with a pretty pink flowery skirt. I loved it. But when I got older, I wanted a more modern look to my room, so did away with the vanity table. Wish I had it back now, though. Funny how you go through different periods in your life & often come back to the beginning. The cottages in the woods on the lake look so cozy. Nice place for a vacation, or even a short get-a-way. When we lived up there several people gave us those kind of vanties. We used them for tables/bookshelves (added shelves) and eventually firewood. 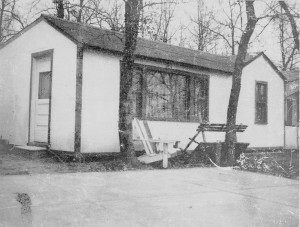 By the time I was coming to the cottage, in the early 1950s, both were completely finished and were cozy, with walls and furniture and everything. I think there is alot to be said for the cottage as a cottage as opposed to the huge houses some people built later. I guess originally there was more time spent outside, unless you got one of those gloomy, rainy weeks. Oh yes those lake cottages of the Great Lakes and the east, perhaps primitive appearance today, but sure they were very comfortable back then and the guys sure seem to be enjoying… reminds me of some of my uncle’s hunting cottages. They eventually got walls up and everything. They were small but we spent every good minute outside. When my uncles moved to Idlewild full time they were in their 70s. 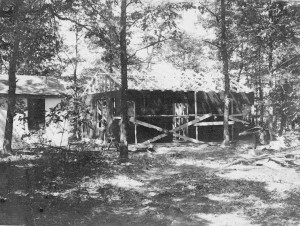 The old cottage was torn down and several new bedrooms were added, along with enlarging the living room and the kitchen of the “new” cottage. Did they add a second bathroom? I can’t remember. 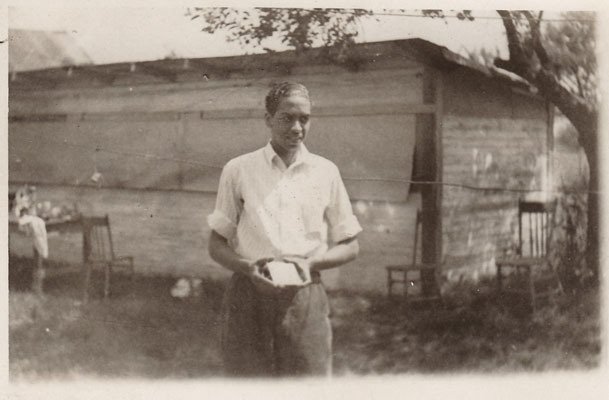 Thank goodness for your family and their letter-writing and photograph-taking. Great that they thought to document by photo the progress of the cottage. 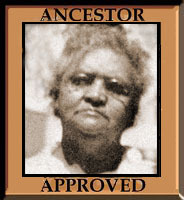 I wish some of my ancestors had done that! I wish my family had had a cottage like that. It must have been hard driving 4 or 5 hours each way, though. It wasn’t a bad drive and we didn’t just turn around and go back. The shortest time would be spending a weekend and then going back. When we lived up there I would sometimes drive down to Detroit for a weekend or more usually, a week. 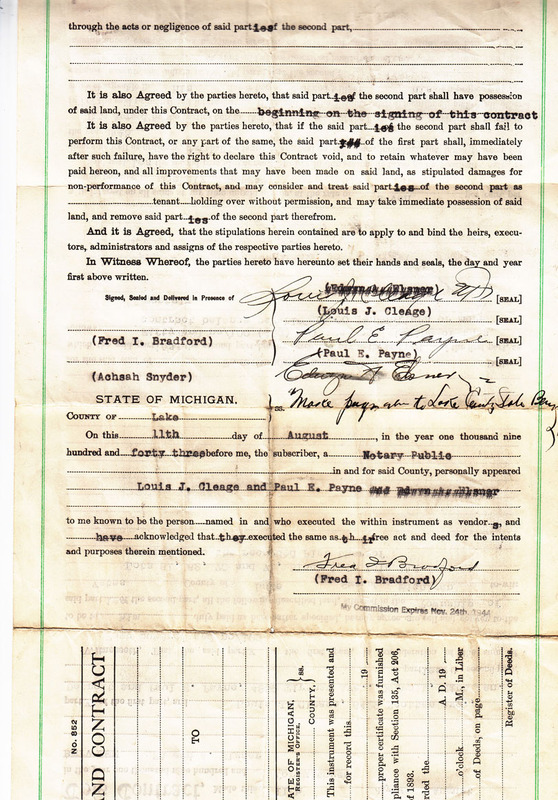 There were also people with cottages who lived in Indianapolis. That’s a 6 hour drive. 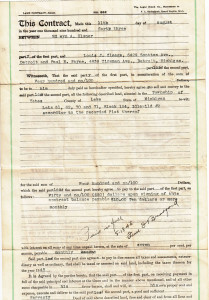 Great to have all those old photographs, plus the contract and letter about it all. My aunt saved all the letters she ever received, and my Mum enjoyed reading them after her sister died, but sadly she then threw most of them out. There is a limit to what you can keep of course, and my Mum didn’t hang on to anything she didn’t need, so really I’m lucky to have what she kept! 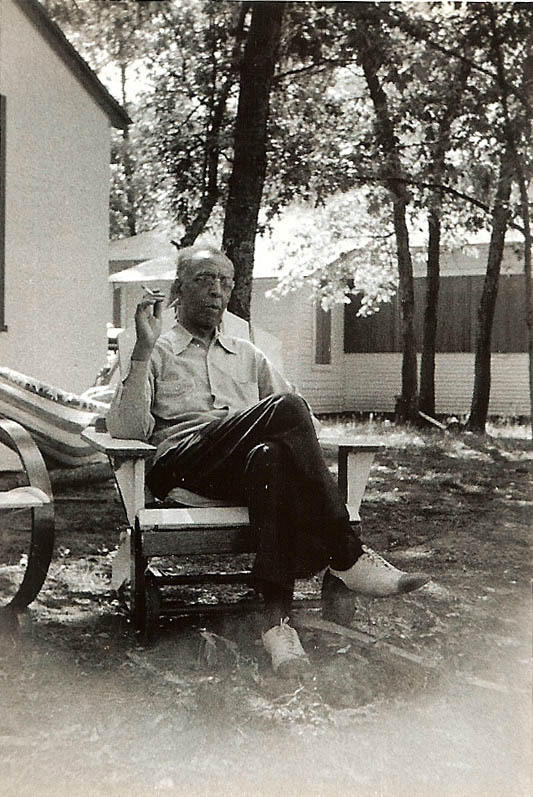 What a great documented history of a summer cottage — it’s just wonderful! And I’m another fan of the “idle men and wild women” saying…Idlewild…perfect. Oh, such memories! These early holiday homes seem so modest and small compared to what passes for similar summer houses today. I can imagine that your uncle found the planning and construction just as rewarding as relaxing next to the final vacation cottage. Now people just pick out a double-wide and don’t get the same satisfaction of doing it yourself. He did. He originally wanted to be an engineer but decided to be a doctor instead but he always liked building things. Oh that record player with canvas deck chairs – wonderful. It looks like the cottage was situated in a good location with a good view. Is the cottage still there? It had a great view. The old cottage was torn down and new rooms added to the “new” cottage in the early 1990s when my uncles moved there year around. That is still there, minus the trees the new owners cut down. They cut down every single tree, front and back, on the lot. I would post a photo of it, but it’s too depressing. 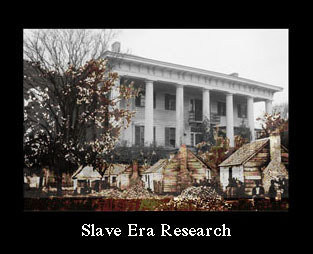 You are so fortunate to be able to take such detailed looks into your history and ancestry. I can see why you urged me to go to Idlewild while I was in Michigan. 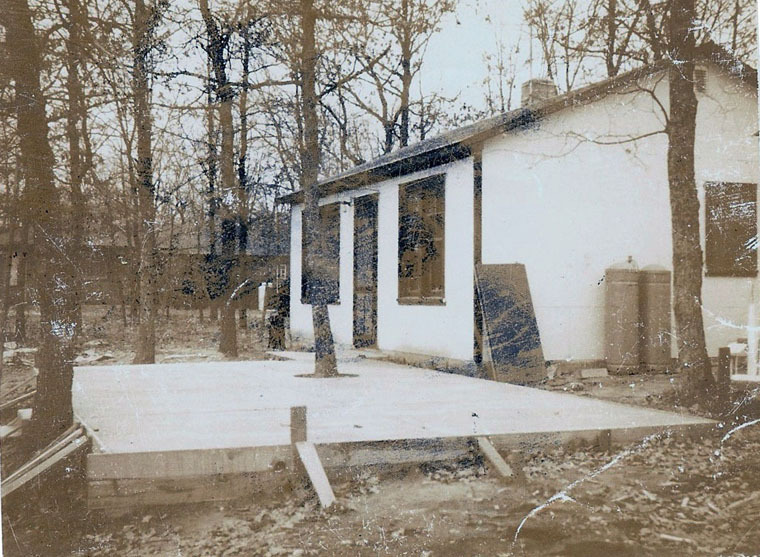 It’s quite an achievement to still be able to document what happed back then when the cottages were being built.